How to switch from native mode to integrated mode (on SSRS 2012 ONLY)? Whilst configuring PowerView, I stumbled across the fact that I was no longer able to switch the mode from native to integrated using the Reporting Services Configuration Tool. Microsoft has decided to change this setting by integrating it to SharePoint and it is not a straight forward process as usual! My SQL Server 2012 developer edition (eval copy) was installed with ALL features selected. Same goes with my SharePoint Server 2010. I would presume that the SQL Server Reporting Service should have been installed and configured automatically on SharePoint but that was not the case! Click the Microsoft SharePoint 2010 Products group. Right-click SharePoint 2010 Management Shell click Run as administrator. Run the following PowerShell command to install the SharePoint service. A successful completion of the command displays a new line in the management shell. No message is returned to the management shell when the command completes successfully. You can also start the service from SharePoint central Administration rather than running the third PowerShell command. The following steps are also useful to verify that the service is running. In SharePoint Central Administration, click Manage Services on Server in the System Settings group. 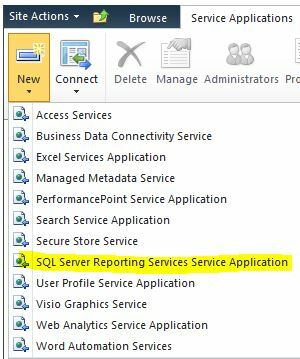 Find SQL Server Reporting Services Service and click Start in the Action column. The status of the Reporting Services service will change from Stopped to Started. 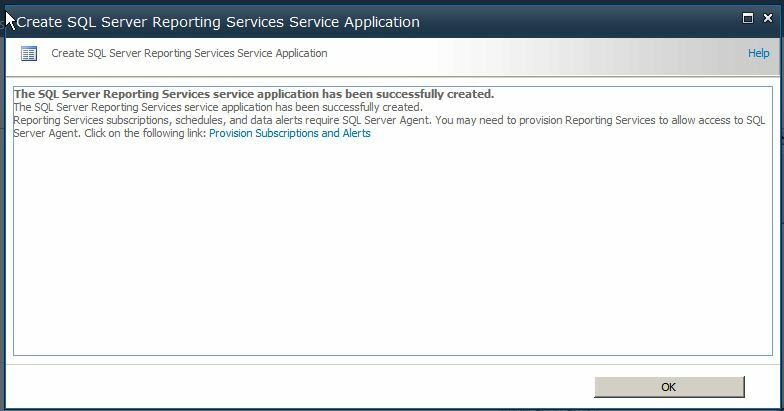 If the Reporting Services service is not in the list, use PowerShell to install the service. In the SharePoint ribbon, click the New button. 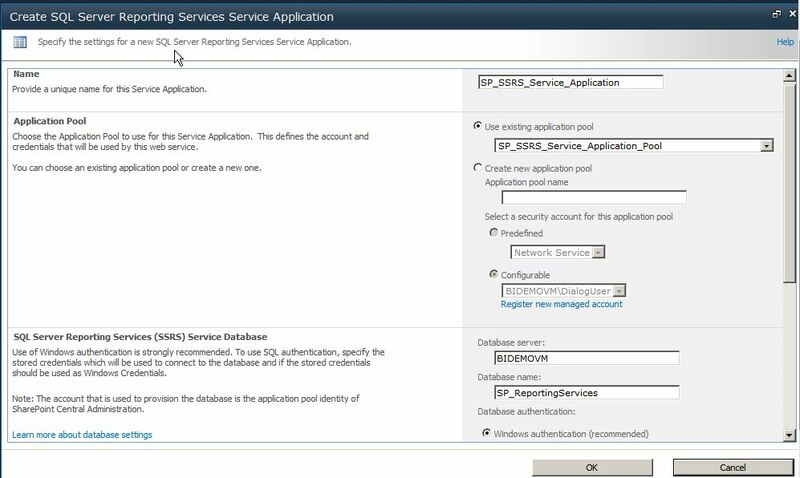 In the New menu, click SQL Server Reporting Services Service Application. If you receive an error of “Login failed for user” as below, then make sure that the NT AUTHORITY\Network Service has access to the database. 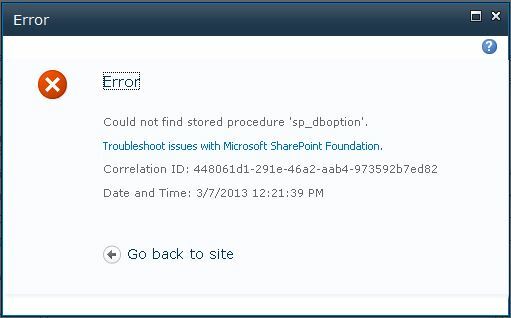 If you receive an error of “Could not find stored procedure sp_dboption” then make sure that the Microsoft SharePoint Foundation Server 2010 (MUST BE 173,633KB in size) and Microsoft SharePoint Server 2010 SP1 were installed. If not, install them. The Microsoft SharePoint Server 2010 SP1 must be installed in order to support SQL Server 2012! Microsoft SharePoint Foundation Server 2010 must be installed first then followed by the Microsoft SharePoint Server 2010 SP1!!! SSRS Service Application (Integrated mode) installed successfully.